From July 21th to July 30th 2018. Number of participants ten (10). From 15 to 18 years old. English will be the common language. A cultural journey, but also time for fun and relax, a detailed program will be sent to each participant. Formal dress is required for the Rotary meeting only. Leisure wear and swimming suit are requested for the daily excursions and other events. Once you get to know Summer Camp you’ll never forget it. Palermo Airport (PMO) or Trapani Birgi airport (TPS). 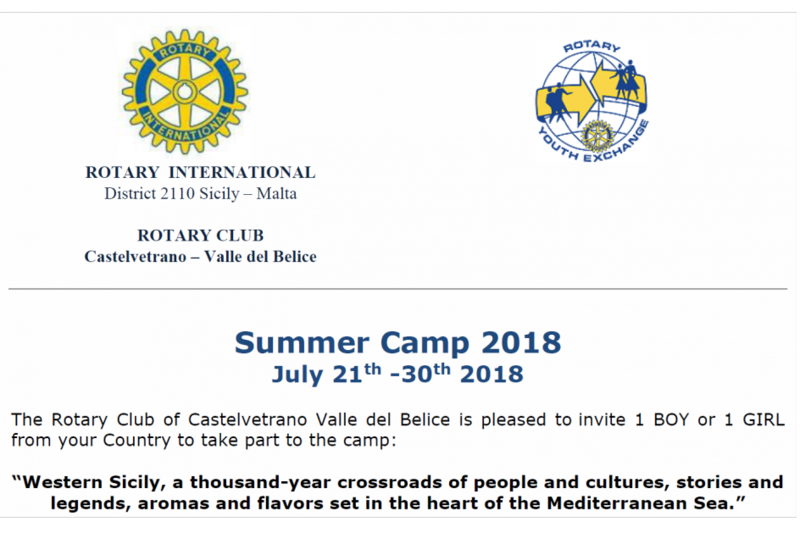 Costs related to the stay in Sicily will be borne by the Rotary Club of Castelvetrano – Valle del Belice and the Rotarian families, participants will have to pay for their travel and all the expenses connected. Participants must be insured against illness, accident and third party damages. All complete applications will be put forward to the evaluation committee consisting of Rotary club members. By May 2018 accepted applicants will be notified and asked to send the airline ticket.